My Dad and Nita left on the 06th and it was time to get on with some work. 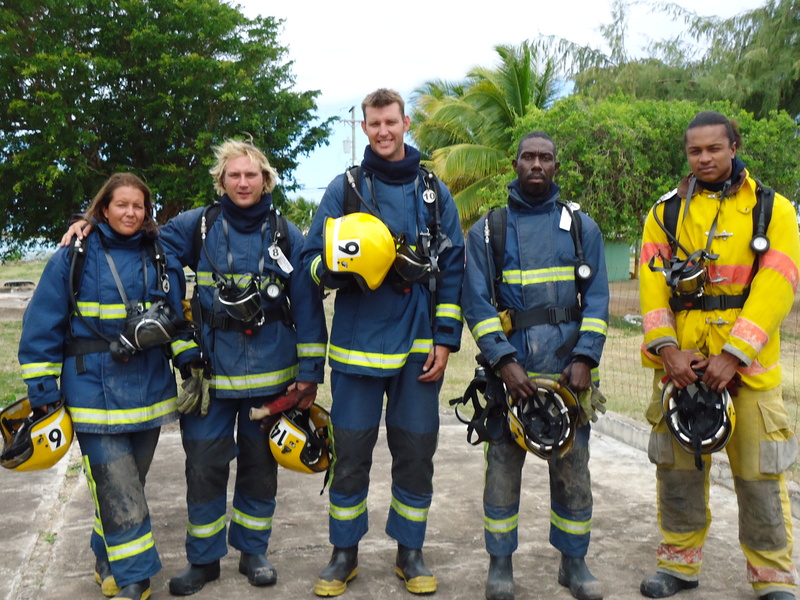 STCW stands for Standards of training and Certificate of Watch keepers. 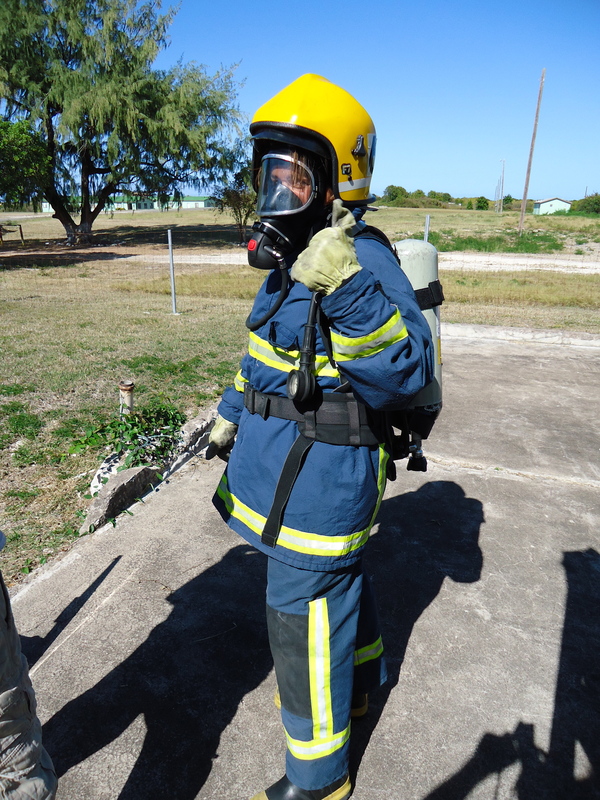 The STCW covers: Elementary First Aid, Fire Prevention and Fire Fighting and Personal Survival Techniques. 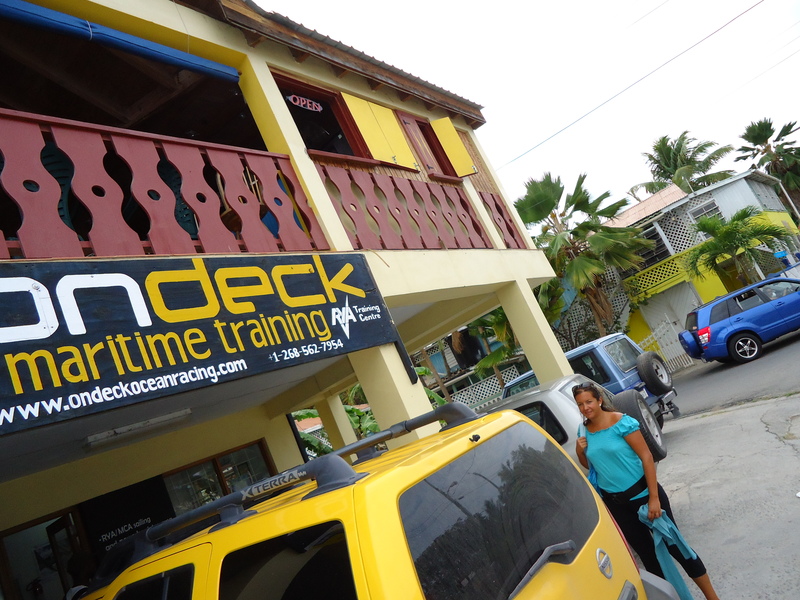 We needed the STCW 95 if we were to join a Superyacht the following week from Antigua to the Bahamas. We had signed up a couple of days earlier with On Deck Sailing school and had paid a total of $2,200 for the week’s course for the two of us. We were looking forward to a change of scene but did not quite realize how difficult elements of this course are. Monday 11th March – First Aid. This course was similar to what you learnt in Scouts, except you can to use a dummy difribulator whilst you are giving Anne (the rubber dolly) CPR. This was a classroom day with 15 of us sat on uncomfortable stools, but at least we had air conditioning. We had a gentleman called Jonathan for the day who was the local Emergency Doctor. The only problem was that he would need to take a call every half hour, which was a little distracting. The evening was much better. We had again met with Rafiki and the lovely family on board. Readers will remember that we first met Rafiki in Dartmouth (UK) and had followed them down to Lisbon, Madeira, Las Palmas and St Lucia. We were eager to catch up and spend time in their company. Rob and Cally invited us to a wonderful dinner on board Rafiki and we all had a lovely evening catching up on their adventures so far. 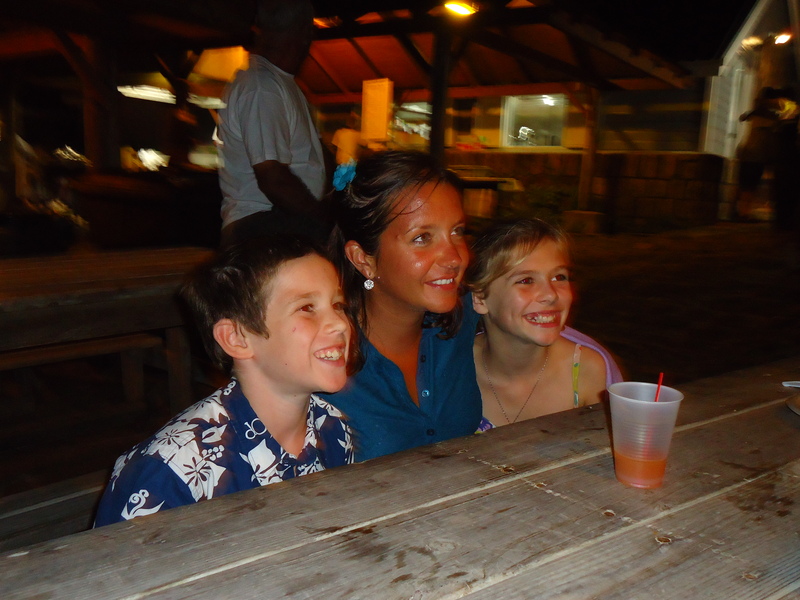 Emily and James entertained us all night – we are so lucky to have such wonderful friends. Another classroom day but this time less gory than yesterdays. We had a great instructor called Logan who is so laid back he is almost horizontal. After watching many shorts movies mainly set in the UK in the 1980’s we had passed this stage. The next 3 stages were to be more practical, which was a relief – or so we thought. We had offered to babysit Emily and James in the evening so that Rob and Cally could go out for dinner. James and Emily came over to Troskala where home pizzas were prepared and cooked before we settled down to watch a film. 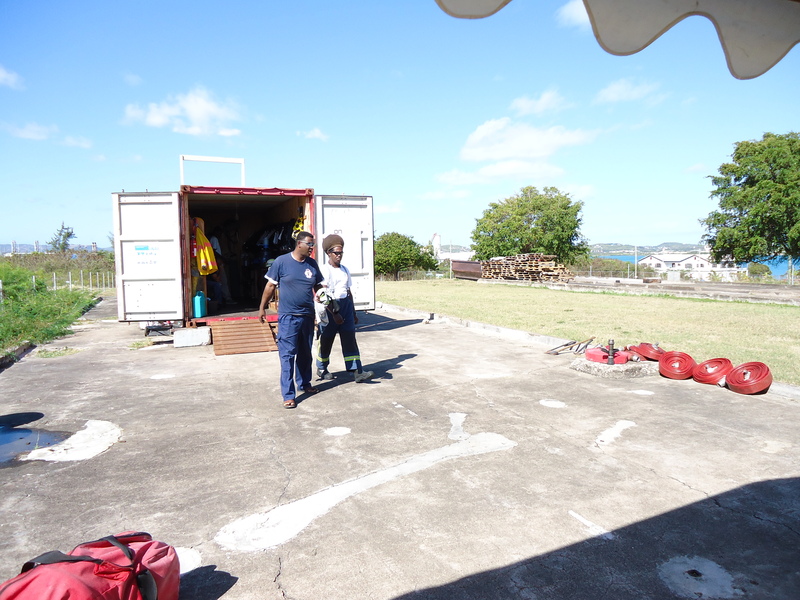 It was to be our first practical day of the STCW 95. As much as we were looking forward to day outside the classroom we were not expecting the heat. 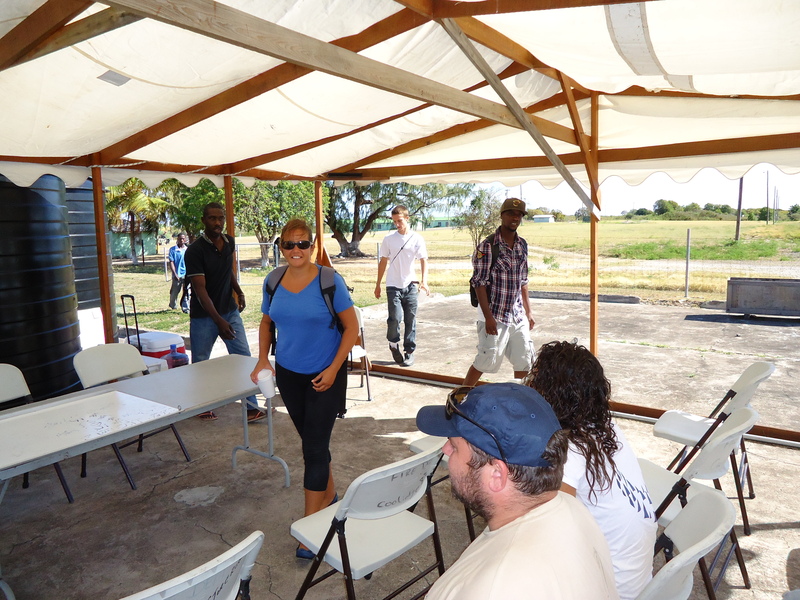 We were driven to an army base on the North East side of the Island where we were greeted by a concrete platform with a few containers and a canopy as the classroom. It was quite a different experience to be looking from our classroom to the turquoise sea below. 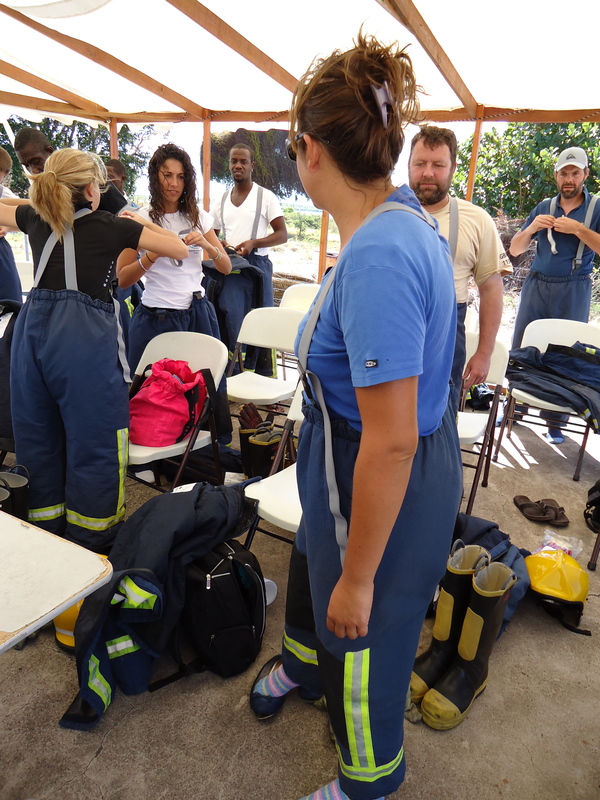 We were each given our uniforms to try on, these comprised of a heat-proof jacket, fireman’s pants, thick socks and some boots. 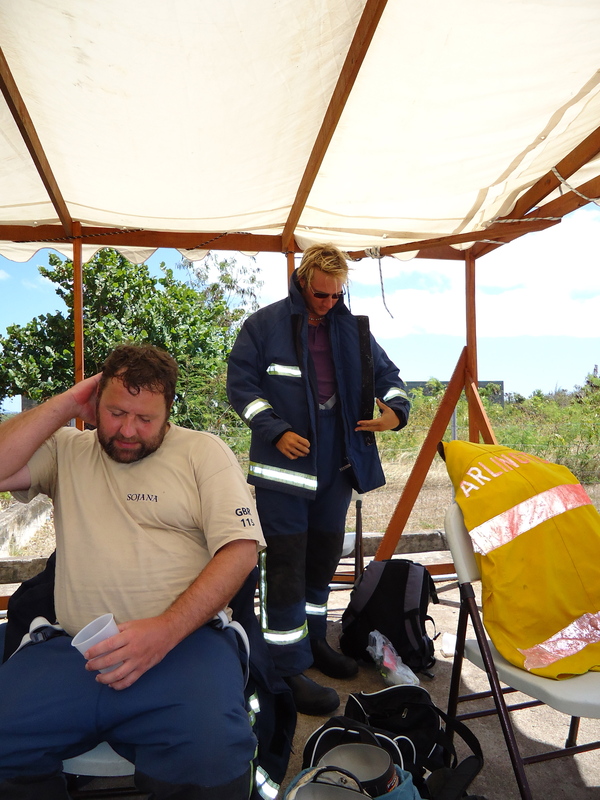 It is difficult to imagine being in 32 degree heat and then wrapped up in a fireman’s uniform but believe me it is hot. As soon as you donned the pants and jacket you were sweating, and with the balaclava and hat on you almost felt faint. 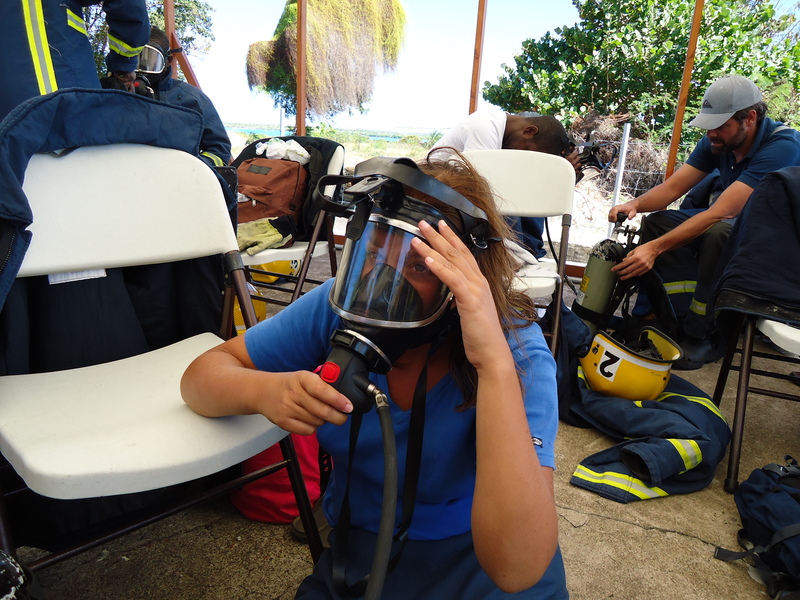 We realized it would have been possibly better to do the STCW in Cowes (UK) as at least you would be cooler than in Antigua. The first day was mainly focused on getting used to the uniform. We were led into the containers later where we were blind followed and had to find our way out using a rope and something called the ‘BA’ shuffle. We were to go into the containers a second time but this time on our hands and knees as the room was filled with fake smoke. The third time was more serious and a real fire was faced. We had to crouch down and find a way out of the container. You could feel the heat radiate from the floor and through your pants and gloves. It has been a long time since I have felt so uncomfortable, but we all made it. In the evening we were invited to a beach party hosted by some newly acquainted Spanish friends and went over with Paulo. After a short time there we headed back to Falmouth for some pizza before heading to bed absolutely knackered. Another day in the searing heat. We arrived at the army base at 09:30 and set up the area. Today we would be facing a real fire within the containers. The exercise at the end of the day would be to flaming container and find you way out collecting a fake body on the way. 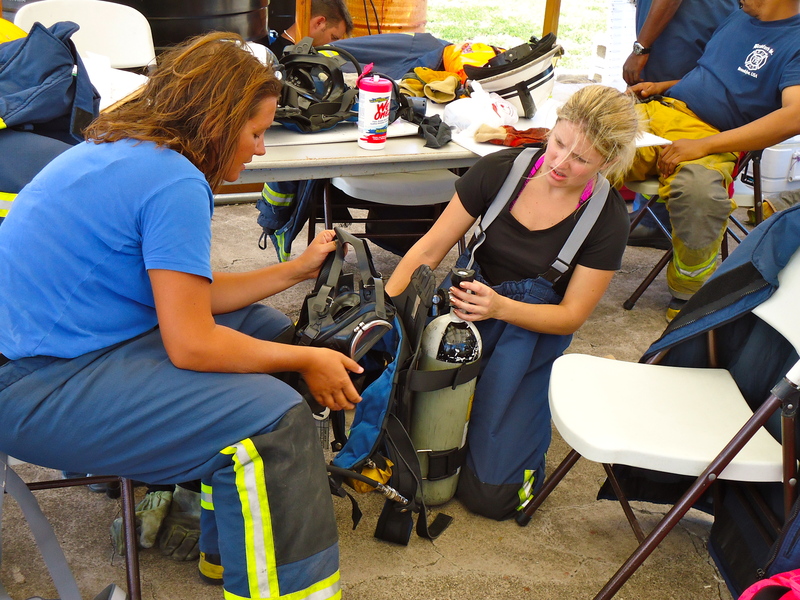 Before we could complete this task we needed to get used to our BA Kit, or Breather Apparatus. Again, in unbelievable heat we now had to also stick a large container on our back and a mask. 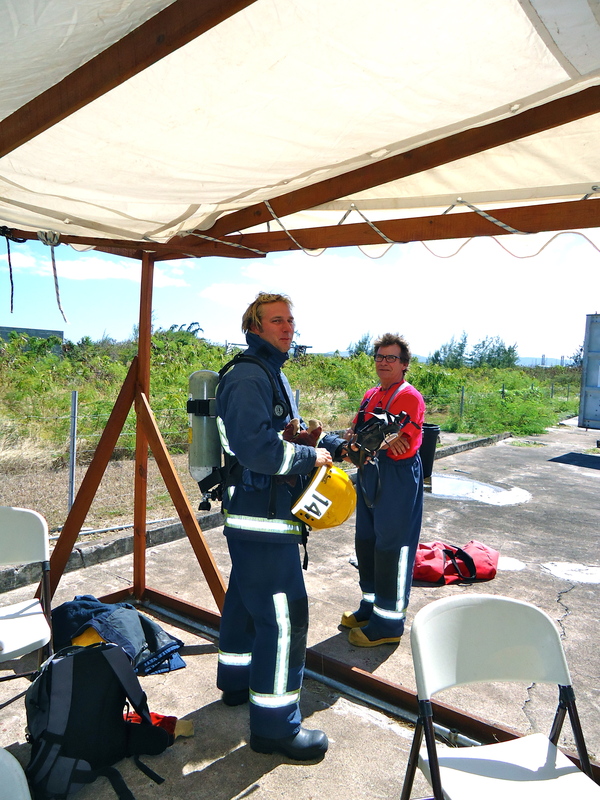 After having lunch and playing with the hoses we were ready for the main exercise. 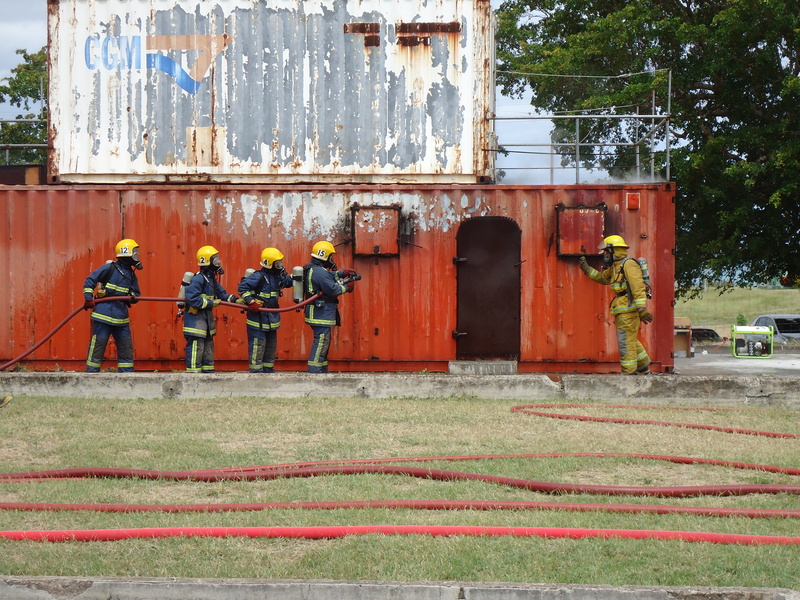 This exercise was basically to go into the containers with the fire, put it out with a large hose, find the body and take it up a ladder and outside. 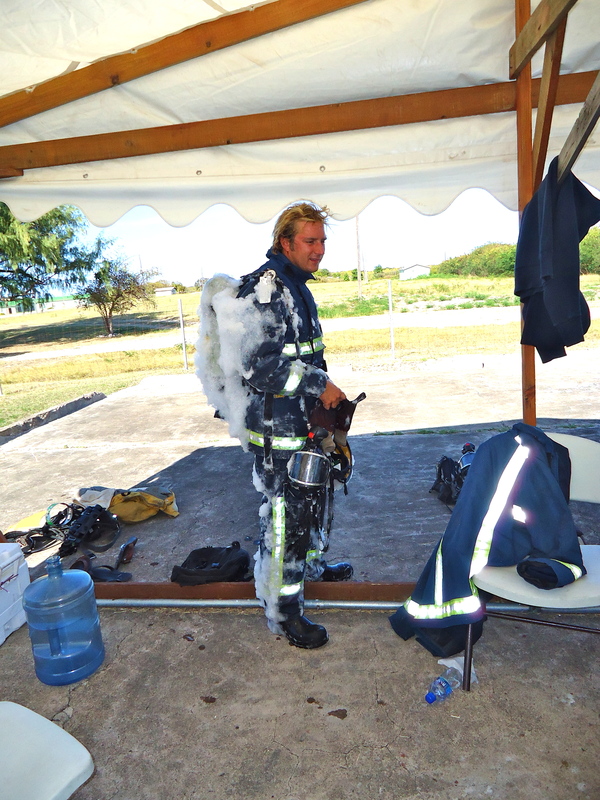 This was not easy and made all my previous hotel fire-training look like a joke. The heat was unbearable with temperatures reaching 400 degrees and the top of the container glowing red with heat. I worried about Carlotta undertaking such a task but she made and came out with a smile and an air of satisfaction. Not everyone passes the STCW 95 at this stage and at least 2 people will have to be taken out before completing the task. 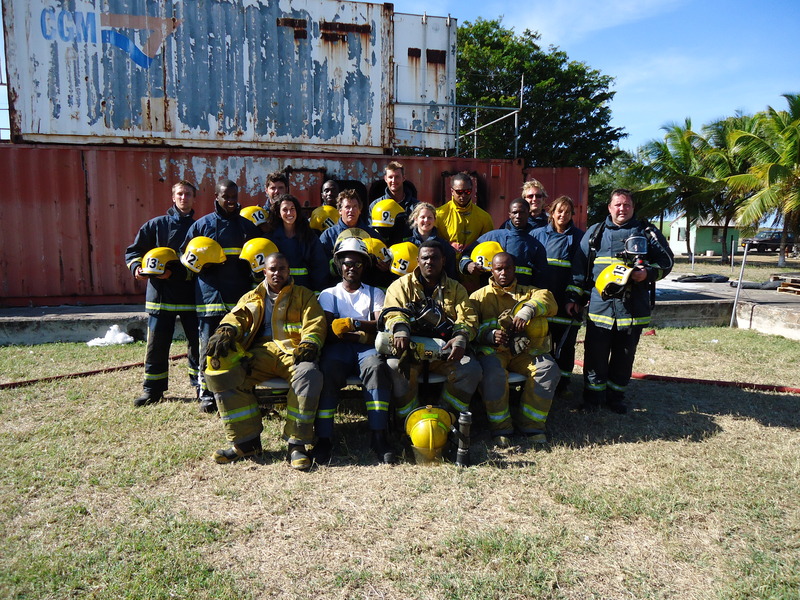 Our group all made and after a short experience with expanding foam we had finished our fire training, which is said to be 3 months fire training squashed into 2 days. We felt exhausted and battered but we had completed and were happy with that. This was probably the easiest of our weeks training, mainly because we were again outside but in a swimming pool. We started our morning with Logan learning about sea survival, what to carry on a yacht and the different types of life raft. We completed several exercises in the pool: Swimming in line, Getting into a life raft, going under and up-turned life raft, and righting a capsized life-raft. After lunch we had some more theory and then departed early. 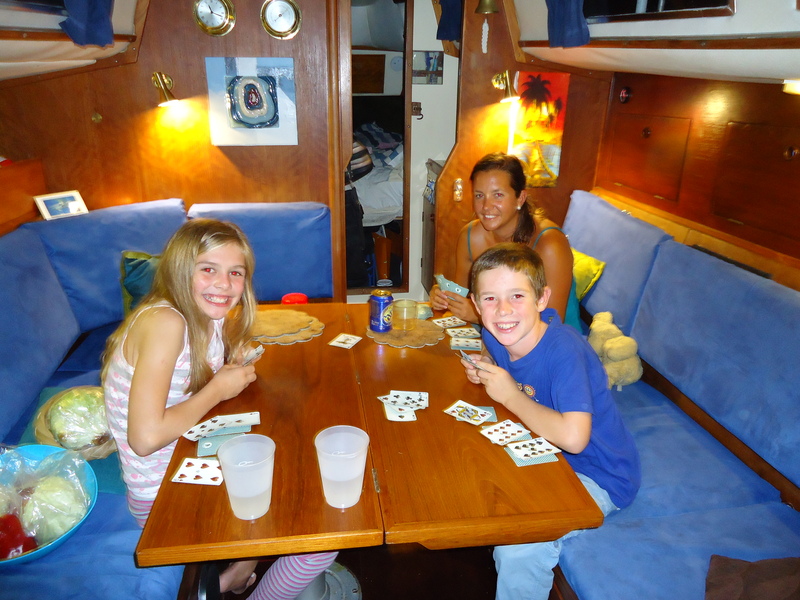 In the evening we were joined by Paulo and Tim (Captain of another yacht who we had met in St Lucia). We had a lovely local dish before going out for a few drinks and catching up. It was a splendid night if not a little drunken. Thank you Helen. We will take a look. Thank you for getting in touch. What changes are occurring your side? Send our regards to Kelvin, Alex and Abbey. We hope you are all well.